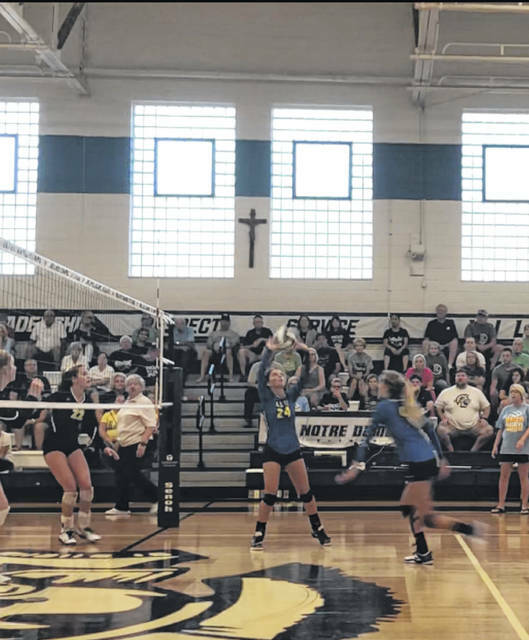 The Clay Panthers swept the Notre Dame Titans in an SOC I conference match Tuesday evening, 3-0. The Panthers will next face travel to New Boston to face the Tigers this Thursday at 5:30 p.m.
On Tuesday evening, the Clay Panthers made a short road trip to take on the Notre Dame Titans in a highly anticipated SOC I volleyball matchup. Both teams entered the game with a 4-1 record on the season and 2-0 in conference play, each team looking for an edge for the rest of the regular season by taking lead in the conference standings. The Panthers would take the match victory in a clean sweep of three games by winning the first set 25-23, the second set 26-24, and the third set 25-21. The first set would start off very even as the teams would trade points early and often. 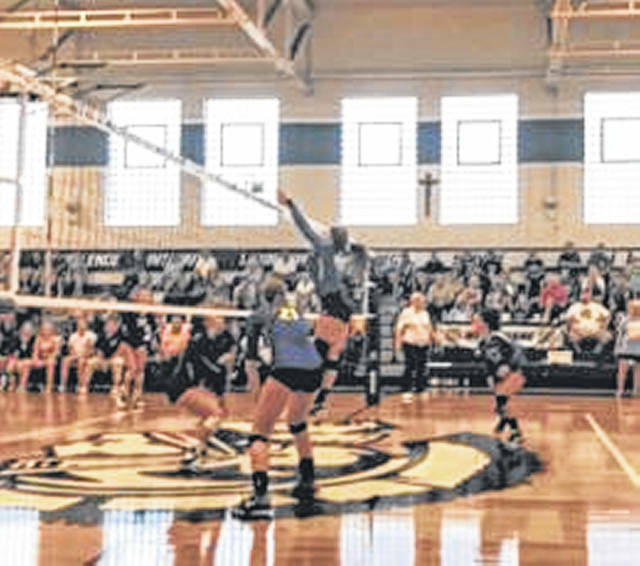 Early in the set, the score would even up at 9-9 and from that point, momentum tilted in the Titans direction as they would score the next seven points of the match, five of which were scored by senior Katie Dettwiller. This would result in a timeout from the Panthers, who trailed 16-9 in the first set. The Panthers would score the next three points out of the timeout, but would soon find themselves in trouble one again after a pair of miss-hits, and a short Titan run caused them to take a second timeout, trailing 21-16. Taking the second timeout would work in the Panthers favor, however. What looked like a runaway victory for the Titans in the first set quickly turned around as the Panthers would score nine of the remaining eleven points to complete a comeback victory in the first set, 25-23. The start of the second set was much similar to the first set as both teams traded points. Neither team wound gain more than a three point advantage, until the Panthers would take a 10-6 lead, which led to a Notre Dame timeout. The four point lead would be maintained for much of the second set, until it was cut in half late, forcing the Panthers to take their first timeout of set two, still leading 20-18. The Titans would continue to show incredible fight, as they would tie the match 24-24. In the end, Clay would pull away and win the set after scoring the next two points and ending the set, 26-24. After the first two sets were very close, it seemed as if the Panthers had one thing in mind: to finish their SOC I opponent and win the match. At the beginning of the third set, the Titans would take the initial lead at 4-3. This would be their first lead since the second set when they led Clay, 2-1. The next set of scoring would make the game reach a stalemate at 7-7. The Panthers would account for eight of the next eleven points scored, taking control midway through the set, 15-10. Three straight points would follow for the Titans, and the Panthers would opt to use another time-out to regroup, still leading 15-13. Both teams laid it all on the line, scoring points back and forth as the Panthers added two to their lead. In the end, the Panthers would seal the victory after the third set, 25-21. The Clay Panthers will be back in action this Thursday evening at Glenwood High School to take on the Tigers at 5:30. You can catch the Notre Dame Titans on Thursday when they travel to Symmes Valley to take on the Vikings at 5:30.